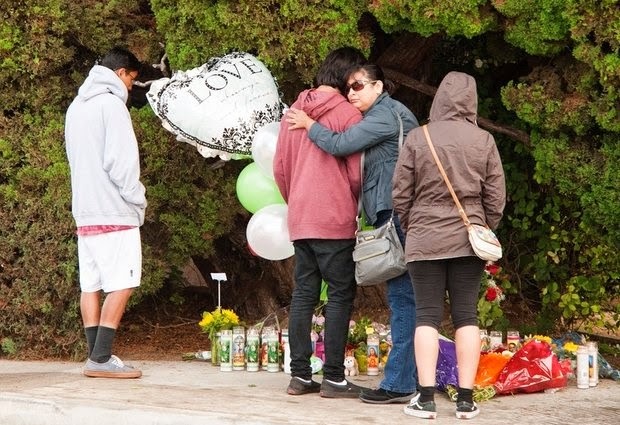 Mourners gather at the street-side memorial at North Jacaranda Street and Fairhaven Avenue in Santa Ana, Calif. on Saturday, Nov. 1, 2014 for three teenage trick-or-treaters killed in a Friday night hit-and-run accident. LOS ANGELES (AP) — Authorities searched Saturday for the driver and passenger of an SUV who fled the scene after the vehicle struck three teenage girls who were out for a night of trick-or-treating in Southern California. Witnesses said the black Honda was abandoned a short distance from the Santa Ana crosswalk where the 13-year-old girls were hit. On Saturday investigators tracked the SUV to the address where it was registered, but the owner has since moved, Santa Ana police spokesman Anthony Bertagna said. "At this point, we don't know where the registered owner lives," Bertagna said. A witness told the Los Angeles Times the girls were wearing costumes with black leggings and dark clothing when they were hit in a crosswalk near an elementary school about 6:45 p.m. Friday. Two of them were declared dead immediately, and a third died as paramedics prepared to take her to a hospital, Orange County fire Capt. Steve Concialdi said. The twin sisters were Lexi and Lexandra Perez, and the third victim was Andrea Gonzalez, the Orange County Sheriff's Department said. "It was Halloween. There were a lot of people out there," Bertagna said. "These guys fled this car. Did they call somebody to pick them up? Did they live in the neighborhood? Did they run into a house?" Sharon Stewart, who cuts hair at a nearby barber shop, told the Times that she was eating outside when she heard what sounded "like a terrible crash. A couple of thumps. Then I heard screaming. I turned, and I saw a car leaving and people yelling. So I thought, 'It's a hit-and-run.' "
The vehicle passed her, so she got in her car and followed, she said. Stewart saw a young man run from the scene and heard him yelling at what she thought was his companion. "I only saw one guy, but I know there was somebody else," she said. Maria Ramirez, 14, who lives about a half block from where the hit-and-run occurred, told the Orange County Register that she attended middle school with the twins. She last saw them at school Friday, she said. "I can't believe it happened," Ramirez said of the deaths of her friends, while she gathered late Friday night on the sidewalk with dozens of onlookers. "They were fun, good girls." In the nearby city of Irvine, police said a man was struck and killed while trick-or-treating with his 4-year-old son. The Register reports the child suffered significant injuries and remained in critical condition Saturday. The driver of a Mazda 3 remained at the scene and cooperated with investigators. Also Friday night, authorities in Washington state said two 7-year-old girls and a 20-year-old woman sustained life-threatening injuries when they were hit by a car while trick-or-treating in Vancouver. The Columbian reported that police said a car jumped a curb and hit the trio. A 33-year-old woman with them and the car's 47-year-old driver, who remained at the scene, had less serious injuries. In New York state, a 3-year-old boy was killed and a 16-year-old girl was seriously injured Friday night when they were hit by a car while trick-or-treating. The car struck the children as they crossing a two-lane road in Greece about 9:40 p.m., police said. They said the driver is cooperating in the investigation and has not been charged. A 2-year-old in Florida trick-or-treating with a group died when he was hit by a bus Friday evening. He was in a stroller with two other children when the adult pushing them across a street realized he had dropped his cellphone. The man stopped the stroller in the median and told the children to stay while he retrieved the phone. The child got out of the stroller and was hit by a driver who did not see him in the street, authorities said.